I am new seller on amazon.com. i want to access my access key id and secret key and token. I am having professional selling account and i am primary account manager. i can only see register as a developer and authorize a developer option. please help me wit this as i want to use those things to automate my system. If you have registered for MWS you should find a link for them on the User Permission page. I have same question! Did you figure it out? You only need MWS Developer credentials if you are developing your own software to integrate your selling business with MWS or if you are developing software for other sellers to use. You do not need to apply for MWS developer credentials to use third party software. You can read more about this and find the instructions to either apply for credentials or authorize a developer in our registration documentation. This may be just because I already use MWS … and have for years … but I have no links or see where a seller on the Professional selling plan actually registers to use MWS. There use to be a link just to “Register for MWS” but that part is now gone. OR are sellers automatically signed up and keys given out … and everyone sees the link to “View your credentials” under the User Permissions to get them. Bottom line … I, nor I think anyone else posting, knows any more what to tell someone on how to just register to use MWS for the first time. You only need MWS Developer credentials if you are developing your own software to integrate your selling business with MWS or if you are developing software for other sellers to use. You do not need to apply for MWS developer credentials to use third party software. On a side note, I hate that the access credentials are labeled “Developer” credentials, it leads to basic misunderstandings. If the seller runs MWS software locally, they will need access to their own “developer” credentials regardless of who wrote it. Evan’s statement (and the registration documentation) about not needing developer credentials is only true for cloud applications, or other instances where a developer is controlling a server running the request on behalf of another seller. I am too old school to think software only runs in the cloud. The documentation Evan linked to appears to be updated, it has the links to register for MWS, the user permissions page, the manage your (cloud) apps page, and the new contact MWS link for resetting your own credentials. It would be nice to know when stuff like that changes, and if there really is a delay before approval for new developer credentials now. I be blind then … because I don’t. Amazon Marketplace Web Service (Amazon MWS) is a secure environment that uses signatures for authentication and lets sellers delegate calling rights to developers by using the Amazon MWS authorization service. 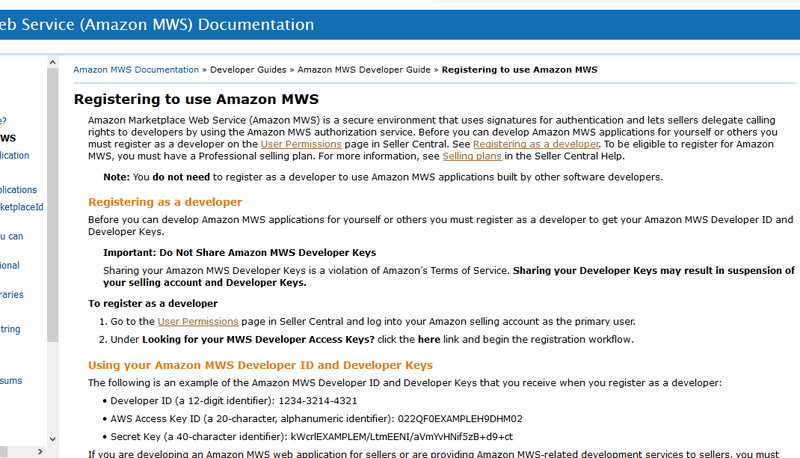 Before you can develop Amazon MWS applications for yourself or others you must register as a developer on the User Permissions page in Seller Central. See Registering as a developer. To be eligible to register for Amazon MWS, you must have a Professional selling plan. For more information, see Selling plans in the Seller Central Help. Note: You do not need to register as a developer to use Amazon MWS applications built by other software developers. Whoops you are correct - the registering as a developer link just refers back to the same page in the documentation. Your link to https://sellercentral.amazon.com/gp/mws/registration/register.html has disappeared from the docs and the user permissions page. i got this reply from amazon. please help. Thank you for submitting your registration for MWS API access keys. After our review, we are unable to grant API access keys. You can find and authorize applications to help automate your business in the Marketplace Application Store (https://sellercentral.amazon.com/apps/store/ref=xx_masdis_dnav_xx) or by authorizing a third-party MWS Developer. Please help me out as i am a developer , i am very much familiar with mws api and i dont want use third party software as they are very costly. I got this message from amazon. Please check your case log in Seller Central and refer to the case related to your application. We have requested additional information from you and we will handle communication with you through that case. To clarify, the MWS authorization model has not changed. However, sellers no longer need to register just for MWS in general. Sellers can either Authorize a Developer or Register as a Developer. You must apply for credentials and Amazon will review the application before credentials are granted. This can take up to 30 days. All developers of MWS software should register as a developer. If the application is approved then you will be able to view your credentials (Developer ID, AWS Access Key ID, and Secret Key) on the user permissions page. What is the difference between Authorize a Developer or Register as a Developer for sellers? If a seller is using 3rd party web (or cloud) applications they can just authorize those applications using the associated developer ID and use the MWS Auth Token given to the seller in those applications. They do not need MWS developer credentials at all in this case. In regard to desktop applications or software that the seller runs locally, those application do still need to use MWS developer credentials. However, the sellers credentials should be used just in the software and not shared with anyone. Has anyone here successfully applied for an Amazon developer? First thank you SO MUCH for your help in this thread, as well as the other one. It’s great to get some of a presence here on some of this stuff ! To clarify, the MWS authorization model has not changed. However, sellers no longer need to register just for MWS in general. I think I finally get it … BUT I would disagree. It has changed. Sellers can either Authorize a Developer or Register as a Developer. You must apply for credentials and Amazon will review the application before credentials are granted. If a seller can just apply for their own keys then I’m still am left without knowing where or how one goes about applying to get keys. BUT it appears that one can’t anymore. How can we set this up in this scenario? Sorry for not being clear. When I said “Amazon will review the application” I did not mean software application; I meant the information the seller provided during the “Register as a developer” process. Basically, for cases where a seller wants to use the scratchpad or write their own app, they are acting as a “developer” at that point and would need their own MWS developer credentials for that. A seller can apply for their own keys by clicking on the “Register as a Developer” button in Seller Central on the User Permissions page and following the prompts. I do get it … no longer is it instant like it once was. It took maybe 5 seconds for me to get my keyset back then. Now it is reviewed and approved, I assume relatively quickly but not almost instant like before. Is this mean that Chrome extensions should ask a user to register as a developer and store the keys in local storage only? No further information was given. I suspect that maybe one of my responses to the encryption questions did not meet the requirements. How can I find out what I must do in order to be approved for my own MWS credentials? It’s pretty important to my business, so I’m willing to invest in what is needed.